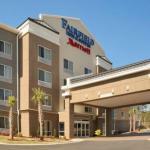 Free continental breakfast free Wi-Fi a seasonal pool and Fort Jackson three miles away bring our guests to the non-smoking Fairfield Inn & Suites Columbia Northeast which offers free parking. The four-floor Fairfield has 79 rooms studios and one-bedroom suites all with signature beds with thick mattresses and cotton-rich linens and bed coverings. Amenities include coffee/tea makers free Wi-Fi clock radios with iPod jacks and plasma TVs with premium cable. Suites have mini-fridges microwaves and sitting areas with sofa beds. A tasty treat awaits at the free continental breakfast of make-your-own waffles breakfast sandwiches cereals breads muffins fruit yogurt coffee and juice. The Negotiator is having a Zen moment on the patio overlooking the lovely and serene rock garden with fountain. You can join him there or jump in for a swim in the seasonal outdoor pool (unheated). The hotel also has a fitness facility laundry facility 24-hour market and free parking. The hotel is in northeast Columbia right off I-77 and three miles northwest of Fort Jackson. Sesquicentennial State Park is about two miles east of the hotel. The University of South Carolina and EdVenture are about nine miles southwest. If you're driving from Columbia Metropolitan Airport the hotel is 16 miles northeast.